The investigation has become more advanced than before with the upcoming development in forensic fields. Every case follows the forensic investigation and it is the very much efficient way of examining data. During the forensic investigation, each loophole will be rooted out. For the forensic researchers, any form of data or information is a great asset to precede the investigation. Therefore, even a bit of missing data can cause a lot of havoc in the investigation as no data means, no findings. Sometimes the evidence may be destroyed by the convicts itself or accidentally by the researcher. Since in both cases, data gets lost, and the loss has to be suffered by the investigator. Similar is the case of PST files, which are amongst the most common formats confronted by investigators in most cases as the message storage format to be examined. The file containing any information that is deleted temporarily can easily be retrieved. However, once it is hard deleted there is no manual provision to recover deleted PST file data. When the file is permanently deleted, it means the space containing the data is marked as deleted. The act of hard deletion does not actually remove the data but marks the space as deleted and available to be replaced for any new data to be added to it. Until or unless space is replaced with another data files or overwritten, there is still huge scope to recover deleted Outlook PST file data. If space is not overwritten or replaced then, repair tools can help in recovering the hard deleted data files. 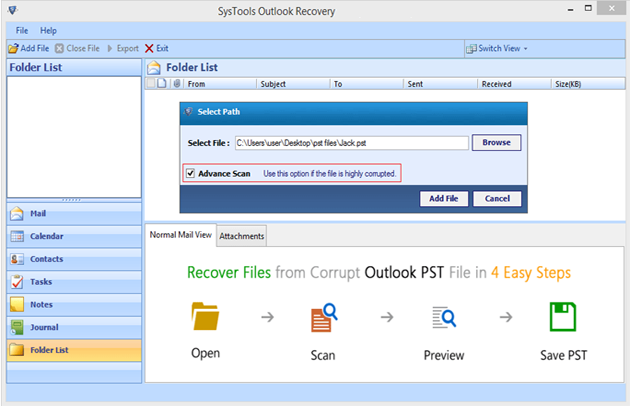 Outlook recovery software is one such tool which helps the forensic investigators to repair corrupt Outlook PST file to overcome similar obstacles when the data from this file gets permanently deleted. How to Recover Deleted PST File Data of Outlook 2013, 2010, 2007 and 2003? Whenever data file is permanently deleted; either by accident or purposefully, Outlook Recovery software helps get the data back. The software is useful in recovering the file even when it is corrupted or deleted. During the usage of the software, the corrupted data is recovered and the user is able to open the file for parsing it. For the recovery of data/items that are permanently deleted from the “Deleted Item” folder, the user should choose the “Advance Scan” mode while scanning files. This option enables users to recover deleted Outlook PST file data. With this advantage, the forensic researchers can dig the evidence for the investigation. The software has “Advance Scan” option that helps in recover deleted PST file data, which is hard deleted. The user should enable ‘Advance scan’ option for such purposes of recovery. Outlook Recovery software helps to recover the files such as; calendar, notes, email, etc., stored within a corrupted data file. There is no limitation imposed on the PST file type provided support for, i.e. both; ANSI as well as Unicode type PST file is recoverable. Software not only recovers deleted Outlook PST file data but, also helps in exporting the required file to either of the formats; PST/EML/MSG according to the user’s requirement and the choice made. The selective number of files can be exported by checking or un-checking the checkbox provided against each. Either files or folders can be exported to required formats as a whole or one by one. Large sized PST files can be split by size ranging anywhere between from 1 to 45 GB. Thus, we can have separate PST files after the export helping in data management. The software has the facility of storing the export results for future reference; if needed. It stores the results in .csv format. By providing recovery of deleted PST file data, the software ensures a full recovery of the Outlook 2013, 2010, 2007, 2003 data file from all possible conditions resulting in catastrophic consequences. It opens up a pathway for forensic researchers by helping them in restoring the hard deleted data files and gaining back evidentiary information.